The AR5BHB92 dual-band (2.4GHz and 5GHz) 2x2 MIMO PCIe design targets enterprise and high-end consumer notebooks & ROS. The solution provides leading 802.11a/g/n performance supporting up to 300 Mbps physical data rates, which enables up to 10 times the throughput and more than twice the range of 802.11a/g/n solutions. With this dual-band design, users will enjoy universal connectivity to any 802.11 network. Driver support for Windows XP,Vista ,WIN7,WIN8,WIN8.1, MAC OS , Linux operating systems & ROS. 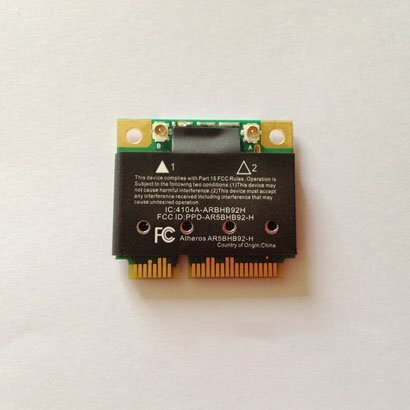 Make sure Half Mini PCI-e interface in your laptop, IF your laptop have Full Mini PCI-E interface must use a Half to Full Height Mini PCI Express(PCI-E) Card Bracket Adapter. (For this bracket please find in our shop). If you have any questions please feel free to contact us by e-mail, need for any driver can also contact us directly.